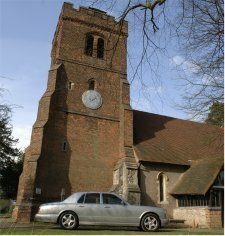 Civilised London Wedding Cars provide you with a tailored chauffeur driven service for weddings in and around London. Civilised pride ourselves that our wedding car hire in London provides you with a seamless wedding service and bespoke approach; your wedding day should be perfect, so let civilised wedding cars strive to achieve absolute perfection. Civilised have been providing Brides & Grooms with London wedding car hire services since 1996 so you can be sure that you will get the very best in wedding cars and an optimum level of service. We recognize that, with all the planning and preparation involved in a wedding, those final moments before reaching the venue should be a chance to relax and reflect on the life-changing events that are about to occur. And our top-of-the-range London wedding cars and reliable, trustworthy service make this possible for hundreds of brides and grooms every year. We work with the restraints of your schedule and budget to craft the perfectly tailored package of wedding car hire services to ensure your day goes as smoothly as you could wish. For weddings anywhere in the UK and Ireland, use our contact page and get a free, no-strings quote on the wedding car and chauffeur service of your choice.